So, Rajiv Bajaj is loud and vocal in targeting Royal Enfield with the Dominar 400 which was launched with a lot of hoopla and sent shockwaves across the country (Launch story) because of its surprise price tag. In a latest, Bajaj has released a promotional video of Dominar 400 which serves two purposes – one, attacks Royal Enfield motorcycles – its chief rival and two, markets the Dominar 400 brand widely. The resonating ad starts with beard-clad bikers (typical of Royal Enfields’) riding elephants which are hard to manoeuvre on various terrains along with the ‘dud-dug’ RE exhaust playing in the background. This is followed by the introduction of three Dominar 400s zooming in and the ad showcases that these ‘new-gen’ motorcycles make long distance riding under various terrains a breeze. 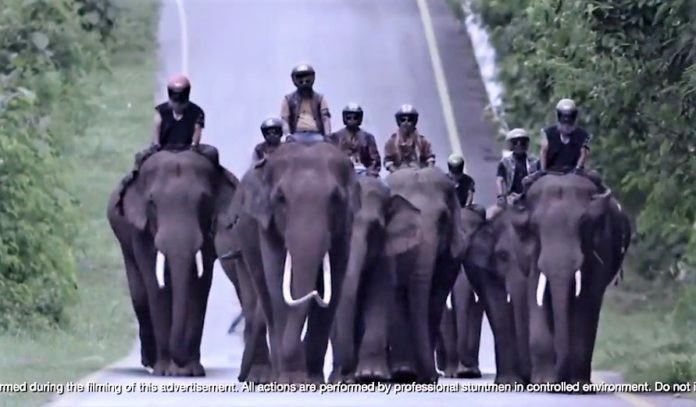 The Dominars fly away with the strongest statement of the ad which said “Haathi mat paalo“! We have seen a lot of direct or indirect battles but manufacturers generally avoid calling (rivals) names! The last big controversy was when Honda’s officials called Hero Splendor iSmart’s 100+ kmpl fuel efficiency figures as ‘misleading’ and ‘impossible’! (Story here). Earlier, Eric Vas, President of Motorcycle Business at Bajaj, at a product launch speech targeted Royal Enfield and said.. There is no doubt that Royal Enfields do not have the latest technology or the performance which sub 500 cc engines can churn out but they have their own charisma. In fact, it is the brand which has the maximum fan following if we talk in terms of Indian motorcycle manufacturers. Quite naturally, this has had various reactions from people. 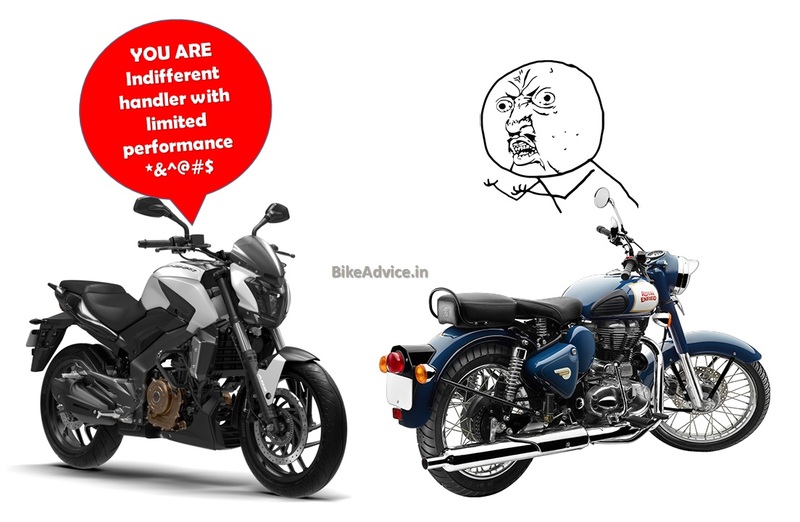 Some are terming this onslaught from Bajaj as ‘childish’, some are calling it ‘hilarious’ and many reactions we have read voice that ‘the truth has been spoken’ but at the end of the day no publicity is bad publicity (until it is the terrible mishandling of Himalayan by RE).